We have been asked over and over again if we had anything for the GM full size crew cab HD trucks. So we went to work on a radical new under seat sub box design for this truck. 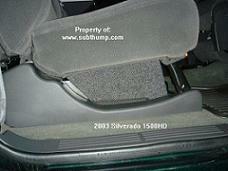 The result: a dowfire box that fits neatly under the rear seat and packs one heck of a wallup. This box hits so hard you will not believe it. Hands down, this is easiest and simplest way to get big sound in your HD crew. As you can see from the photos our under seat subwoofer box is designed to fit both the the bench seat rear and the 60/40 split rear seat. You've probably noticed that there aren't a lot of boxes out there for this particular truck. 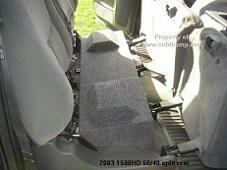 And nobody does one for the newer style split seats without major modifications required to the truck. Many of the boxes out there are quite generic-looking or don't fit too good. Not to mention that when they say you must remove this bracket or that bracket, they actually mean that you have to "cut" the bracket out of the truck. Not with our under seat subwoofer box. Our box requires no modifications to the truck whatsoever. The box fits great and sounds even better. It molds around every part of the under seat area, including all the tricky seat bracing and supports for an authentic-custom look. You don't even have to take out the jack. One of our customers suggested that you can drill another hole in the bass plate of the jack so it can simply be rotated out of the way and re-positioned. Other than that, just drop the box into place and start. thumpin'. This is a two-chamber sealed box with .55 cu.ft. of air space per chamber. It is meant for two 10s or two 8s only. There is no way to fit 12s in this box so please do not ask. Two 10s were a challenge and pound quite nicely. Standard mounting depth is now 6-1/8", and is even expandable to 6-5/8" if you add a 1/2 spacer. There is no other crew cab box anywhere with a mounting depth that deep. There are a few knock-off imitations out there but don't fall prey to their gimmicks. This box is a must-have if you like your bass low and loud in your HD crew cab. With out a doubt, this is the loudest best sounding style box you can put in your crew cab, making this box our best selling box for this truck. 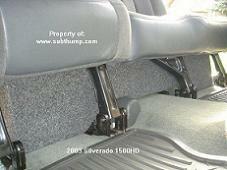 Don't settle for anything less than a quality crew cab box from Subthump. If some other imitation looks 'cheap', it probably is just that. Our box is the real deal. Get yours today, they are going faster than ever!